We have been so busy since we arrived back home last weekend, we almost forgot to mention our brush with greatness on the way home from Cincinnati. 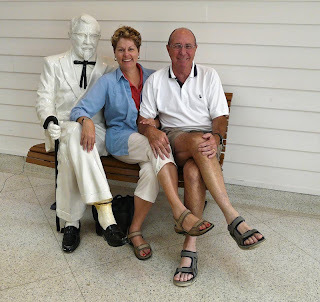 At about the time our stomachs started to remind us it was time for lunch, we saw a billboard on I-75 pointing the way to the Birthplace of Kentucky Fried Chicken—Sanders Café and Museum in Corbin, Kentucky. We were off on a lunchtime adventure. 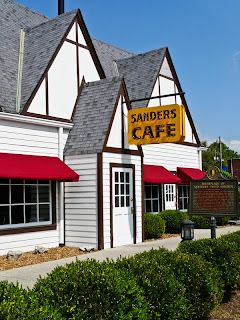 Harland Sanders had a lot of jobs before he settled down in Corbin in the 1920s to run a gas station along the Dixie Highway, which ran from the Midwest to Florida. An entrepreneur, he soon was selling sandwiches at the service station, then expanding his food service to include a café across the street, and later a motor court next to the café. A historical marker out front proclaims the café the birthplace of Kentucky Fried Chicken, and displays interspersed throughout the restaurant fill in the details of its illustrious history. Sanders was awarded the honorary title of Kentucky Colonel shortly after he opened Sanders Café in 1935, in recognition of his gastronomic contributions to the state. I was most impressed with his promotional genius—he recognized that women were the final arbiters in decisions about where to spend the night when families were traveling, so he created an exact replica of an immaculate room from his motor court right inside the restaurant. Women had to walk through the motel room to get to the Ladies Room. The pay phone was also on the other side of the hotel room. Brilliant! Unfortunately, when I75 was built it bypassed Corbin in 1955, and traffic going by the café and motor court slowed to a trickle. The Colonel almost went broke before he began the next chapter in his entrepreneurial story--going on the road to sell Kentucky Fried Chicken restaurant franchises. By 1960 he had sold 400 franchise units, and his days of worrying about money were far behind him. Of course we had to dine on some of that finger lickin’ good original recipe fried chicken, since we were eating at its birthplace. Just when we thought lunch couldn’t get any better, in walked the Colonel himself, or a reasonable facsimile thereof. 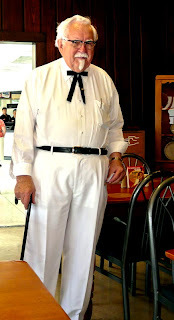 Turned out it was Colonel Bob Thompson, whose business card proclaims him Spokesperson for Kentucky Fried Chicken and Ambassador for the World Chicken Festival. Tally it up: an offbeat museum, a finger lickin’ good lunch, and an opportunity to shake the hand of a real live celebrity, all in less than an hour. This was road tripping at its finest. Who knows what further adventures we might have had if we had stayed on Dixie Highway, instead of making our way back to I75 and rushing home without further detours or dalliance.